2019 Register now for the Joint Final Conference of SmartResilience and SAYSO projects! 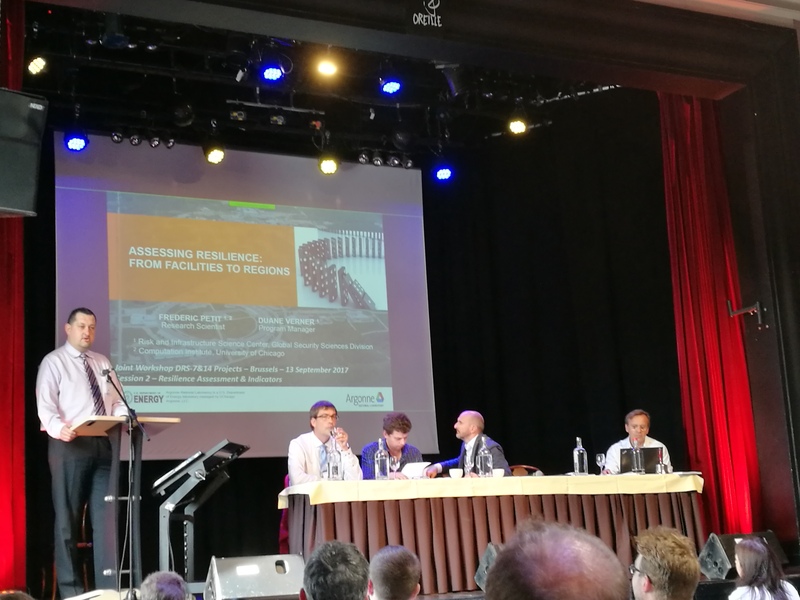 The SmartResilience and SAYSO H2020 projects are excited to announce their Joint Final Conference entitled "An EU Initiative Towards Advanced Situational and Enhanced Resilience." The conference will take place from April 15-17, 2019, in Budapest, Hungary. The joint final conference of the SmartResilience and SAYSO projects will be hosted by the National University of Public Service in Budapest. The objectives of the joint conference are to present and discuss their respective outcomes as well as to discuss next steps. The conference will involve practitioners, developers, technology suppliers, and standardization and procurement specialists, as well as decision-makers, to find the best ways to harmonize, integrate, and enhance the projects’ outcomes in order to achieve tangible impact at the European level. Additional Costs: Conference participants are responsible for covering their own travel, lodging, and associated costs. The SmartResilience and SAYSO projects are seeking contributions/presentations related to critical infrastructure resilience and protection and to situational awareness systems in civil protection. Proposals for contributions, including title, authors' names, and a short abstract (max. 1500 characters) should be sent to SAYSO-SmartResilience-Conference@eu-vri.eu using the application form available for download below. *Please Note: Contributors/presenters should also register for the days of the conference which they will be attending! Poster presentations will be displayed during a 90-minute poster session with the attendant author(s) available to discuss and present the poster (e.g. from EU or other projects). These will be scheduled on the afternoon of Monday, April 15, 2019. Abstracts for posters should be sent to SAYSO-SmartResilience-Conference@eu-vri.eu using the application form available for download below. *Please Note: Poster presenters should also register for the days of the conference which they will be attending! The final program is available for download here. 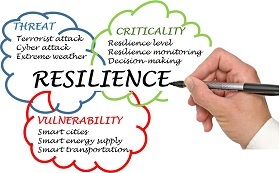 The SmartResilience project provides a new indicator-based methodology for assessing and measuring the resilience level of critical infrastructures, such as energy and water supply, transportation networks and similar. The SAYSO project aims to allow European civil protection and emergency responder organisations to procure, at a competitive price, innovative Situational Awareness systems and tools matching their needs. The production of the specifications of such solutions in SAYSO also involves suppliers, public procurement authorities and policy makers. For information on how to reach the venue, click HERE. The conference organizing committee is not recommending any specific hotels for conference attendees, as we have decided this is best left to the personal tastes and preferences of each participant. However, there are many good options available near the venue, and any hotel in or near the city center should also be close to either a direct or connecting public transit line with a stop close to the conference center. An example of hotel options available near the venue is available through Google's hotel search tool. The SmartResilience and SAYSO projects have received funding from the European Union’s Horizon 2020 Research and Innovation Programme, under the Grant Agreement Numbers 700621 and 740872, respectively. The support provided by the European Commission for these projects and for their joint final conference is acknowledged and greatly appreciated. Steinbeis R-Tech and EU-VRi passed the ISO 9001 audit based on the 2015 revised version of the standard which is focusing on risk thinking and strategic planning. 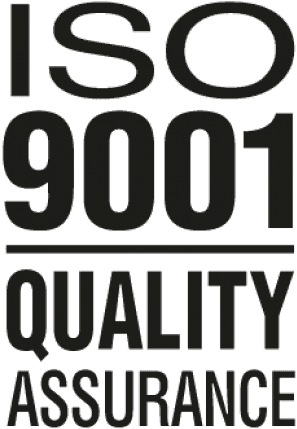 The ZDH-ZERT audit took place on February 7-8, 2019 and showed again that the Steinbeis Advanced Risk Technology Group and EU-VRi duly improves and complies with the requirements of ISO 9001 Quality Management. The audit has covered the areas of integrated risk management and industrial safety with multidisciplinary, global and holistic approach, including education and training, information providing, innovation, professional services and consulting, products and software, project management. Steinbeis Center for Energy Technologies increased its visibility by achieving a milestone: The paper on "Evaluation of Electricity Generating System’s Technology Mix Using 3E Indicator" appeared in Journal of Thermal Science published by Springer. See more at https://rdcu.be/bjPQZ. It is also a great achievement for both Steinbeis Novi Sad and for Steinbeis Advanced Risk Technologies Group (www.risk-technologies.com). SmartResilience is referenced in a recent update to an International Organization for Standardization (ISO) webpage highlighting the work being done for the new standard ISO 31050 - Guidance for managing emerging risks to enhance resilience. The standard and will provide the guidance needed to deal with the "new, previously unknown or not considered, 'emerging' risks [which] can pose the greatest challenges to resilience, safety and operational and business continuity" and draws upon the work of organizations and projects including SmartResilience. This standard is currently under development by ISO/TC (Technical Committee) 262 ‘Risk Management,’ which "develops international standards in the field of risk management to support organizations in all their activities including making decisions to manage and minimize the effects of accidents, disasters and faults in technical systems as well as response and recovery from major disruptive risks." 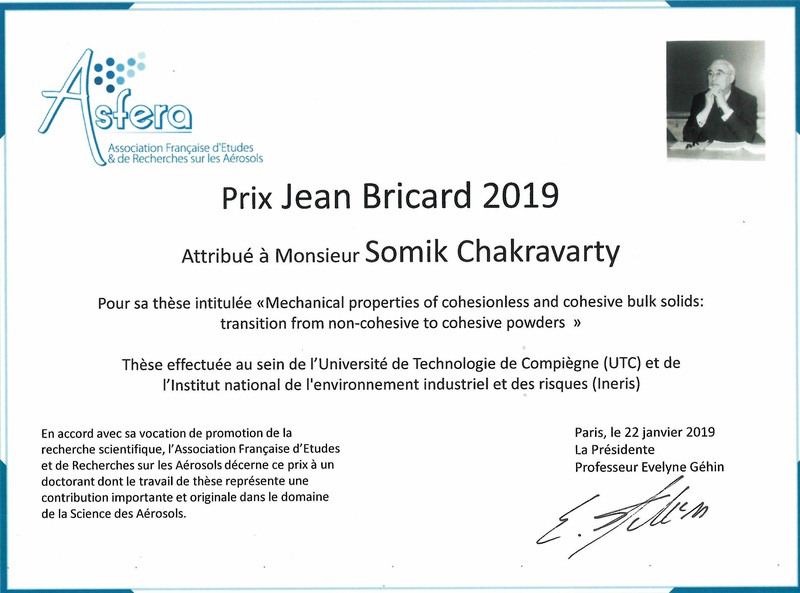 Somik Chakravarty (R-Tech) was awarded the Jean Bricard prize 2019 at the 32nd French Congress on Aerosols (CFA) in Paris on 22 January 2019. Somik Chakravarty, Project Manager at Steinbeis R-Tech received the Jean Bricard Prize 2019 for his PhD thesis in Mechanical properties of cohesionless and cohesive bulk solids: transition from non-cohesive to cohesive powders. The PhD was supported by European Union Marie Curie Actions FP7 T-MAPPP and conducted at the Sorbonne Universités - UTC and INERIS, France. 2019 Participate in our stakeholder survey for the development of risk assessment tools! Within the framework of H2020 project PANBioRA, the consortium is developing new techniques and instruments for biomaterial risk assessment. In this regard, Steinbeis Advanced Risk Technologies (R-Tech) is carrying out a stakeholder survey for the development of risk assessment tools. Please take a few minutes to fill out our survey. We would very much appreciate your input and expertise! Help us develop an integrated risk governance framework for biomaterials and related devices/products by participating in the survey. Participate in our survey and receive feedback! The SmartResilience project is highlighted in the recently released Safety Science journal article "Quantitative resilience assessment in emergency response reveals how organizations trade efficiency for redundancy." SmartResilience Project Coordinator Prof. Dr. Aleksandar Jovanović is one of the article's co-authors. The authors note that their "results open the obvious possibilities for optimization along several lines that could be explored in future research," including comparison of "'big-data-based indicators'...This option would open up a completely new way of looking onto the monitoring of resilience in real time, which was exactly the idea promoted by the SmartResilience project." The SmartResilience project is excited to announce it will be hosting its final conference in joint collaboration with the SAYSO Horizon 2020 Project from April 15-17, 2019, in Budapest, Hungary. Registration will open in early 2019. More information is available in the "save the date" invitation below. The joint final conference of the SAYSO and SmartResilience projects will be hosted by the National University of Public Service in Budapest on April 15-17, 2019. The objectives of the joint conference are to present and discuss their respective outcomes as well as to discuss next steps! The conference will involve practitioners, developers, technology suppliers, standardisation and procurement specialists, as well as decision-makers to find the best ways to harmonise, integrate, and enhance the projects’ outcomes and achieve tangible impact at the European level. If you wish to participate as a speaker, please contact us before January 31, 2019, at SAYSO-SmartResilience-Conference@eu-vri.eu. The e-registration for all participants will open early 2019. To be among the first informed, follow us on Twitter! Contributors and participants from other projects and institutions are welcome to attend. We look forward to welcoming you in Budapest! The SmartResilience project recently published two more public deliverables in the Results section of its public-facing website. 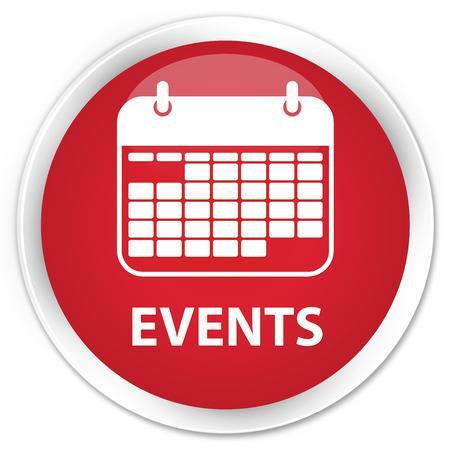 The SmartResilience team will be attending and participating in several upcoming international events for promotion and dissemination of the project. The SmartResilience project is excited to share several recent updates related to its web tools, including the launch of the MySmartResilience and updates to the Welcome web page of the tool. 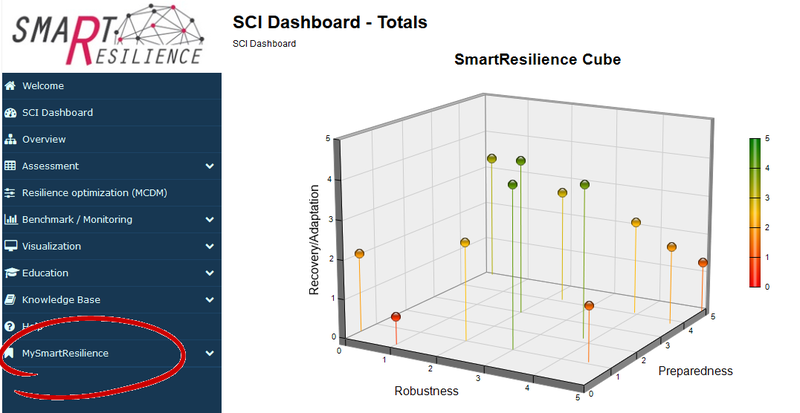 A recent update to the SmartResilience web interface includes a new section of the tool called MySmartResilience that enables personalized data entry, analysis, and saving. Project stakeholders should contact smartresilience-core@eu-vri.eu to gain access to this section of the tool. 1. Testimonials have been added to share end-user and project participant experiences with and impressions of SmartResilience. 2. A Feedback Survey is now available via the “Tell us your opinion” button and directly via this link: http://www.smartresilience2.eu-vri.eu/Survey_Run.aspx?ID=978. We ask that interested parties please help us by taking some time (estimated 10-15 minutes) to complete this survey to help us improve the SmartResilience tool and potential applications. This survey can be distributed to anyone who may be interested in providing feedback. There is also an opportunity included in this survey to provide a testimonial for the project. As stated on its website, WaterBriefing is "an information service, delivering daily news, company data and product information straight to the desks of purchasers, users and specifiers of equipment and services in the UK water and wastewater industry." 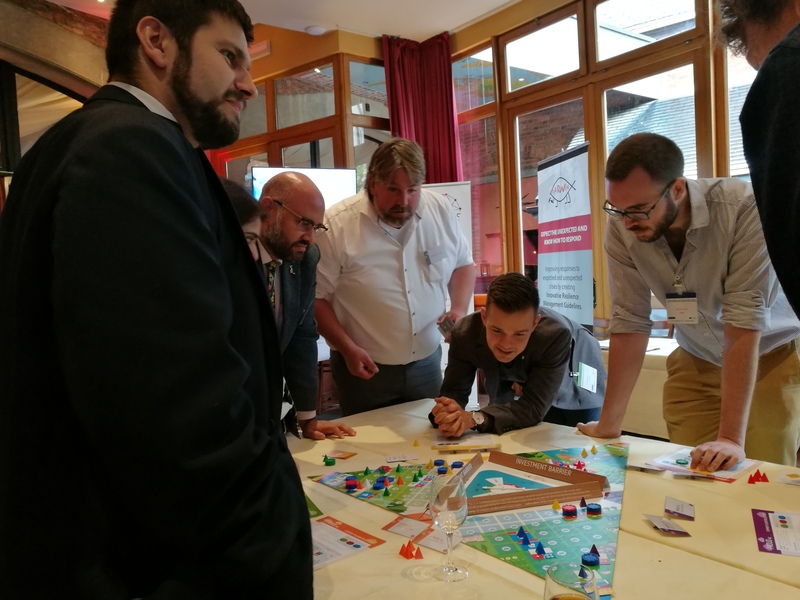 The article describes SmartResilience's series of real-life based case studies, such as the FOXTROT case study focused on assessing the resilience of drinking water supply in Swedish cities. 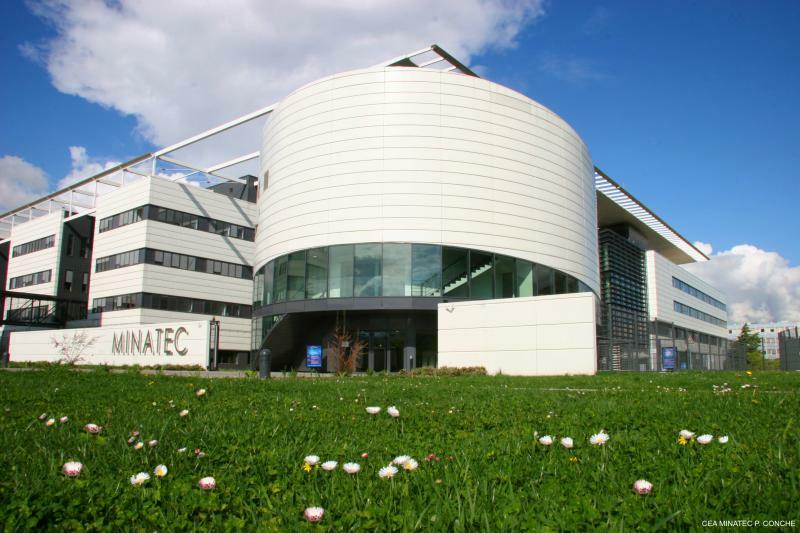 If you are attending nanoSAFE 2018 – The Sixth International Conference organised by nanoSAFE, come join us for our one day event and get a say in building the EC4SafeNano Centre. To understand the needs of the various stakeholders. To identify the resources and capabilities available inside/outside the consortium to address the stakeholder needs. To provide solutions and build a range of services. To develop mechanisms and operating procedures. To test and benchmark the services. To develop a sound exploitation plan and business plan. The project is structured around a core project partners and an enlarged community of associate partners (APs). The main objective of the open focus network is to design subject-specific focus groups. The Focus Network is accessible to everyone upon becoming a registered member by joining as an associated partner. Aim: Discussing the already proposed concepts of the centre, exchange of information and services, promote the centre, collecting feedback and check the willingness of external participants to join as APs. Expected Outcome: Use the feedback to adjust the centre and its functioning. Aim: BNP-DS will focus on the production of a blueprint (a set of guidelines for do’s and don’ts) for the development and sustainability of a nanosafety platform. It will be an interactive session between the representatives of various nanosafety platforms and other stakeholders. It is a first step towards the development of EC4SafeNano network for nanosafety platforms. Expected Outcome: Determination of organisational elements necessary for the development, sustainability and networking of a nanosafety platform. Aim: The workshop aims to gain feedback on utility and user acceptability of proposed solutions to knowledge management and FAIR data and based on the user / stakeholder feedback to develop recommendations regarding solutions to maximise data sharing and data accessibility for the entire community and all stakeholders. Among the barriers to be considered, and for which best-practice solutions will be developed, are: Primary publication of data before the data are made available in a database; Labelling of the data (ontology); Confidentiality of the data; Security of the data storage and access (trust that the data are protected); Format of the data for long-term accessibility and sharing etc. Discussion on the solutions presented and other key barriers – suggestions to improve / adapt etc. Collection of other examples of low-cost / Open Source tools for data management / data sharing from the stakeholder community. Expected Outcome: A set of recommendations for EC4SafeNano data providers on how to capture, process and share their data to maximise its FAIRness, i.e., its Findability, Accessibility, Interoperability and Re-useability, which is essential to enable EC4SafeNano partners to provide their proposed services. Potential case studies where solutions are still missing will also be identified, which could be taken up within NanoCommons, e.g. with EC4SafeNano as the “User” of the NanoCommons research infrastructure expertise. 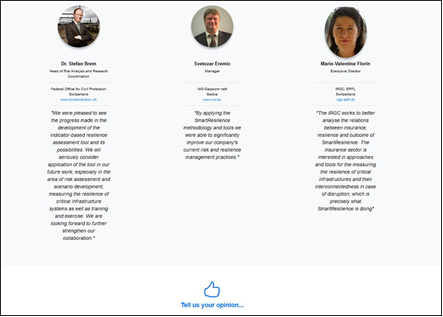 Feedback to NanoCommons and ACEnano on their tools and services will also be provided. Event Type: Open for all but registration is mandatory. Target Audience: Regulators, industry and consultants, academics and standardization bodies. Organisers: E. Frejafon (INERIS), N. Shandilya (TNO), I. Lynch (UoB), A. Jovanovic & G. Balachandran (EU-VRi). Participation in the event is free of charge and is open for all, but registration is mandatory due to limited capacity of the meeting room! The project is funded by the European Union's H2020 research and innovation programme (call H2020-EU.2.1.2.2. - Ensuring the safe and sustainable development and application of nanotechnologies; grant n° 723623). Prof. Aleksandar Jovanović recently gave an interview for the leading German economic newspaper Wirtschaftswoche, recognizing the importance of standardization work in the area of risks. EU-VRi, Steinbeis, and Prof. Jovanović are long-time active leaders in the area of standardization related to emerging risks, currently working on a new ISO standard, ISO 31050 Guidance for Managing Emerging Risks to Enhance Resilience. Globalization is driving forward world networking. But with complexity also comes risks. How can you correctly assess a threat situation? Are we even worried about the "right" things? And how can you handle risks that have global implications? An interview with Prof. Aleksandar Jovanović, Head of the European Virtual Institute for Integrated Risk Management (EU-VRi). KL: Mr. Jovanović: natural disasters, infrastructure damage, political imponderables, supply chain disruption, piracy, sabotage, cybercrime - the number of risks in international business seems to be growing. Is that really the case, or is it just because we know more and more about risks? AJ: That's not so easy to answer. What does "growing" mean? What we do know is that the present has become more complex and often entails new risks. As a system becomes more complex, in general, the risks become more complex, and the number of potential and new risks increases. The problem is that in order to really assess a threat situation, we need reliable reference points. At the “regulars” table you can talk about the real dangers of climate change at length, but as long as you do not have a reliable framework to define priorities, criteria and decision-making processes (when it comes to risk assessment) all remain just a roundtable discussion. KL: You could consult experts. AJ: Yes, of course you could, and of course you do, but that does not really make you “pass.” For example, if every expert has a different opinion, we get a collection of responses in silos. 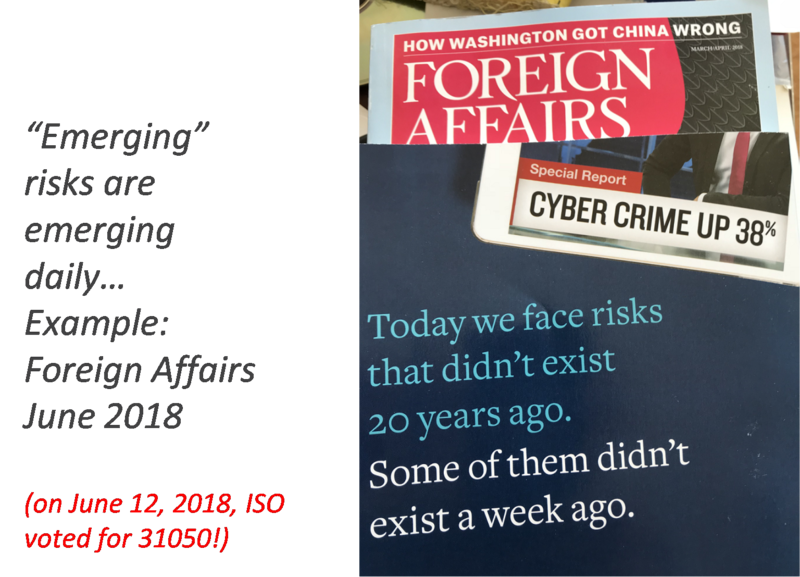 This is a very unfavorable situation, especially when dealing with complex risks, because here [with complex risks] it is particularly important to act interdisciplinary and to see the "big picture." KL: Do you mean [to imply] action guidelines for companies and institutions? AJ: Right, and here comes the next challenge: the classification of responsibilities - "mandates" - has also become more complex. As a result, it is often the very institutions that are supposed to exercise these mandates globally, such as the UN or the EU, which become increasingly powerless or unfree in doing so. At the national level, it is often not much better. 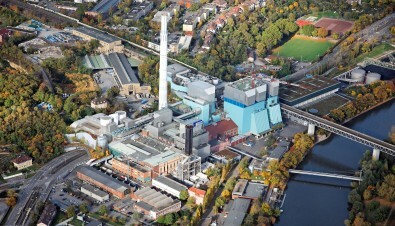 Although consensus on dealing with complex and systemic risks is certainly very important, as well as [achieving] the acceptance of as many people as possible, the reluctance of an institution [to act], such as a competent ministry which actually has power to act on an issue such as “coal exit,” is out of place. KL: What is the general policy in the area of risk management? AJ: In my opinion, there is definitely room for improvement. Many authorities and institutions have long lost much of their expertise and have many specialist personnel issues. Take the cybercrime field: since it is often impossible for authorities to engage the right IT professionals to provide the TVL-like conditions, many “cybersecurity centers” lack the right professionals or expertise. KL: What about the situation with companies? Do they usually have more financial leeway? AJ: That's right, but they have the problem of having to decide whether to invest long-term or short-term. For example, insurers who have been dealing with risk management issues for years often have to balance the investments they have in short or long-term risks because they cannot always afford the required research on the long-term, more complex risks. As in politics, they are simply less and less interested in long-term planning. It's worth less or even nothing at all. KL: Let’s speak [more] concretely about the risks that we are dealing with in business and society. The sociologist and risk researcher Ortwin Renn, with whom you have worked for many years, sees the greatest danger in so-called systemic risks. AJ: Yes, Mr. Renn means risks that can have global implications, are closely networked with many functional areas of the economy and society, and have cause-and-effect chains where we cannot get by with a classic, statistic-based approach. Here we need a fundamental change of perspective. KL: What do you mean? AJ: One should say goodbye to the idea that one could simply avoid or combat systemic risks like an external disturbance. The truth is that it is no longer about avoiding risks but understanding them as best as possible and preparing for them in the best possible way [in order] to ensure the resilience of the systems. That's one thing. The other is that solving complex and global problems usually has to be complex and global. Global also in the sense of "integrative" and "integrated". KL: You have to explain that, please. AJ: The decisive factor is the integration of various solutions into integrated risk management. That is exactly what we are doing at the EU-VRi, [the Virtual] European Institute for Integrated Risk Management. In doing so, one must try to consider all the different sources, including those, for example, that can cause or promote the misperception of risks in social networks. Nowadays, you have to be able to analyze the large amounts of data available – “Big Data” -, to be able to analyze new methods and have new analysis software. This is the only way to detect new trends in risks in good time: by observing them in real time and to derive recommendations for action from them. It is very useful to compare these results, which you can get without experts, with expert opinions. KL: So risk analysis tools alone are not enough [to avoid risks]? AJ: No, because even with these tools you will hardly be able to avoid them; new solutions also generate new risks. A classic example is the risk of Alzheimer's disease. That [risk] is one in a hundred at the age of 65 but one in six at the age of 85. One could say: by avoiding the risks that lead to an early death, at the same tome you increase the risk of developing [other] diseases that increase [in risk] with age. That this pattern is repeated in other fields, such as the exit from coal, autonomous driving, or Industry 4.0, is to be expected. KL: These are topics in each of which the aspect of social acceptance plays a role. Now many of your colleagues say that we often cannot assess risks properly. Isn’t it first of all a matter of distinguishing "real" from "fake" risks? AJ: Of course you can do that, but you should be careful not to take so-called "false" risks less seriously. For a long time, insurers have had their own term: phantom risks. Although they have no material, statistical basis, they should still play an important role in a risk analysis. To perform a full risk analysis, one must consider factors such as risk perception and social acceptance. If technology is accepted in one corner of the world and not in another, it is important to understand why. KL: Like, for example, the Transrapid? Exactly. A cutting-edge technology that has not found social acceptance. Not least of all because the risks associated with the Transrapid in Germany and the classic train have been considered and categorized. Then it would be, as in every train, an emergency brake would be required on the Transrapid, while nobody would think of installing one in an airplane. KL: What recommendations do you give to politics and business? AJ: It's all about recognizing the importance of frameworks for efficient risk management. Just as we have agreed in many countries to drive to the right or measure speed in km/h, we also need more commonly accepted risk and resilience management standards in risk research - such as the new ISO 31050. That's because we need maximum clarity and the above framework in the implementation. Only then will we have a chance to prepare efficiently for the challenges of old and new risks. On October 16, 2018, Steinbeis R-Tech and EnBW organized a workshop devoted to the new EU standard on Risk-Based Inspection (RBI) EN16991:2018, published on May 1, 2018. Participation in the workshop was free of charge. On May 1st, 2018 the new EN16991:2018 standard was approved. It establishes the basis for application of European standardization in the area of RBI in Europe and worldwide. Following the pre-standard CWA 15740:2008/2011, the new EN16991 is aligned with API RPs and supported by national documents such as VGB 506-S. Already mentioned in the legislation of several countries, the standard supports a more efficient and effective inspection and maintenance planning in the industry (power, process, other). At the same time, it improves risk management and thus, safety, of the plants and their operation, including all aspects of improved environment and business management. This workshop is designed to present detailed information about the standard and its present and future applicability in industry. Participation in the workshop is free of charge and is based on limited free seats; therefore, registration is mandatory! In the spirit of new policies (e.g. the EU directive on non-financial reporting), ever increasing social responsibility and awareness, and the needs of globalized economies (e.g. overcoming differences in compliance rules in different countries), the need to prove that one is investing efforts in “SAFETY BEYOND LEGAL COMPLIANCE” and “STAYING RESILIENT WHEN AFFRONTING NEW RISKS” will increase. The ERRA Agency, proposed here and based on the outcomes of the EU project SmartResilience, intends to help prove the effectiveness of the above effort, e.g. by means of RECOGNIZED VOLUNTARY AUDITING performed by the network of partners acting through the Agency. 3. 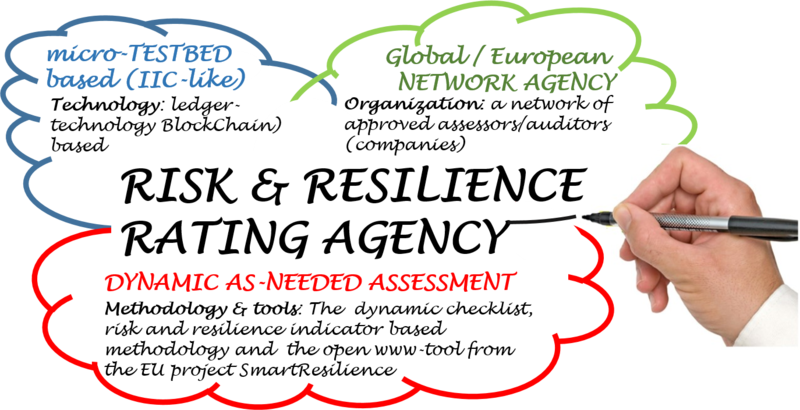 Creating a business model based on the project and its results – both for project partners and the community: The “European Risk & Resilience Assessment and Rating Agency” (ERRA). The ERRA concept is being elaborated (2018/19) by EU-VRi as a part of the SmartResilience project deliverables. The customer registers at the page, submits request for using the online ERRA (SmartResilience) tool and, request approved, get the access to the tools and supporting documents. There are no fees, but the assessment (anonymized) remains in the pool and can be analyzed (big data) or viewed by other users. The self-assessment report is audited by the ERRA appointed auditors. The fee for the audit apply. ERRA issues an audit certificate. ERRA appoints assessors/auditors, they do the assessment and produce the report. ERRA issues the full audit certificate. Members, in the due course, may also offer further member-specific service through the Agency. 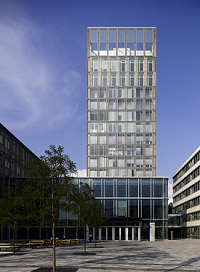 The Agency itself is envisaged to be registered in Germany as a service-oriented company. EU-VRi, its members and the SmartResilience project partners will be offered the first “say” in the process of establishing the Agency. After that, the access to Agency membership should be open to all interested parties, signing the agreement) with the Agency. Agency members can be both institutions/organizations/companies and individuals. The possibilities for obtaining the start-up support of the EU-ESA will be explored. 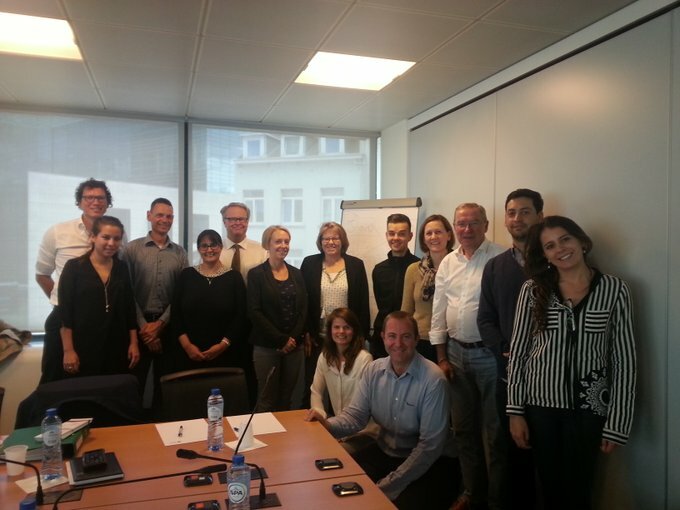 SmartResilience Project Partners met in Brussels on September 11-12, 2018, in order to discuss the CORE list of issues and the INDIA case study. On the first day, Prof. Jovanović introduced the concept of the CORE dynamic checklist (DCL) and presented the SmartResilience tool. During this day, the workshop participants also reviewed the issues and finalized the CORE DCL. On the second day, a tabletop exercise was conducted to simulate cascading and ripple effects on combined scenarios (CASE STUDY INDIA). 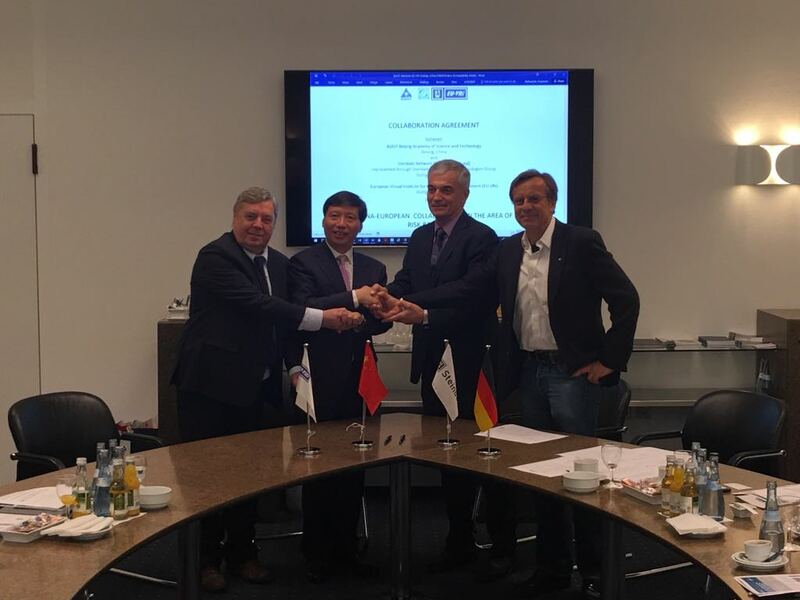 2018 Beijing Academy of Science and Technology, Steinbeis, R-Tech, and EU-VRi sign a collaboration agreement in the area of Risk Management. 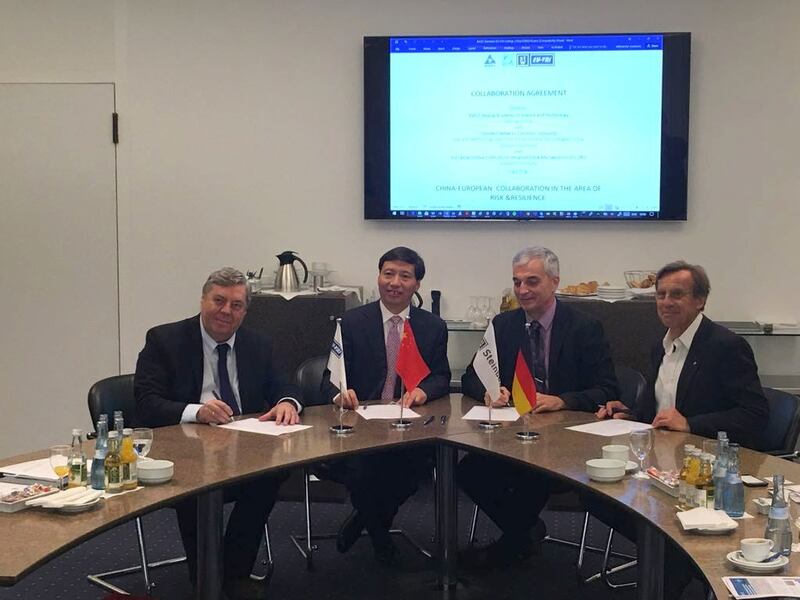 On August 16, 2018, Beijing Academy of Science and Technology (BJAST), Steinbeis, Steinbeis Advanced Risk Technologies (R-Tech), and the European Institute for Integrated Risk Management (EU-VRi) signed a collaboration agreement in the area of Risk Management. 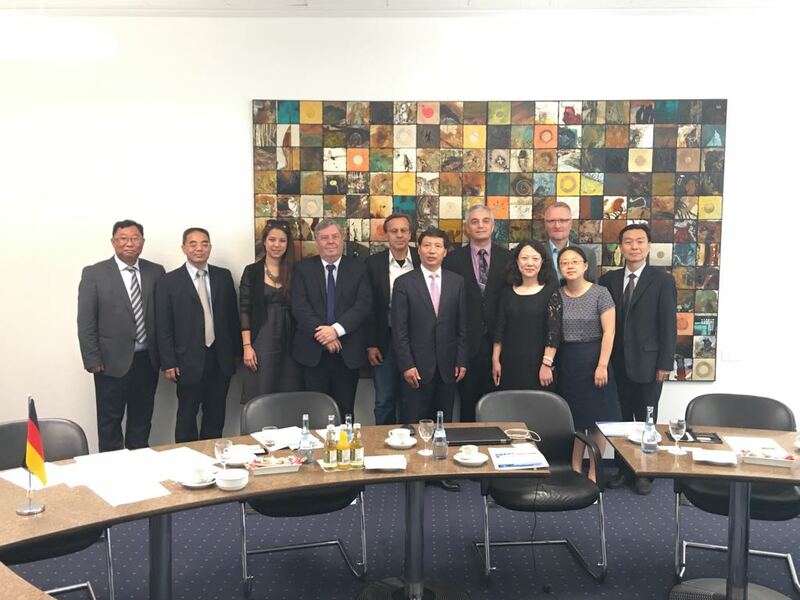 The delegates from the Beijing Academy of Science and Technology participated in a meeting with Steinbeis Advanced Risk Technologies (R-Tech) and the European Institute for Integrated Risk Management (EU-VRi) in Stuttgart, Germany on August 16, 2018. They discussed possible projects in the area of emerging risks, risk management and resilience. During the meeting they officially signed the future framework collaboration agreement between Steinbeis, EU-VRi and BJAST. On July 27, 2018, the ISO Technical Committee TC26 approved work starting on the development of the new standard ISO 31050 Guidance for Managing Emerging Risks to Enhance Resilience, under the convenership of EU-VRi. Download the leaflet at https://www.eu-vri.eu/filehandler.ashx?file=16526. At the current pace of change, the world in the 21st century will experience 20,000 years of advancements, in just one 100 years (WEF, 2016). This is changing the risk landscape and bringing in an avalanche of new uncertainties and new emerging risks the management of which is essential for the society. The new ISO31050 standard will provide the much needed foresight and insight to deal with these risks. It will also provide new ways for enhancement of organizational resilience and new capabilities to deal with new challenges, helping, at the same time, to increase the level of trust in management of risk. The newly revised and published International Standard on Risk Management ISO31000:2018 is created, monitored and supplemented (with supporting documents) by ISO Technical Committee TC262. ISO31000 standard is one of the few ISO Standards (of the several thousand promulgated by top experts in their fields) that is qualified as a "generic ISO standard" – this means that all other standards must accommodate and align to its provisions. Therefore, it is mission critical for every entity utilizing ISO Standards, to address and strategically approach risk management and, when doing so, to follow ISO31000. New, previously unknown or not considered, “emerging” risks can pose the greatest challenges to resilience, safety and operational and business continuity. These “new and/or increasing” risks can be related to different areas of activities, such as new processes, new technologies, new types of workplace, or social or organizational change. They can also be some long-standing issue, newly considered as a risk due to a change in social or public perceptions or due to new scientific knowledge. The increasing behavior of these risks means that the number of hazards leading to the risk may be growing, or that the exposure to the hazard leading to the risk is increasing, or that the effects/impacts of the hazards are getting worse (e.g. seriousness of effects and/or the number of people affected). These risks will interrelate with the processes like globalization, digitalization, innovation, cross boundary operations and many others, inextricably, directly or indirectly influencing each other, being interconnected, systemic and/or interdependent. "ISO31050 Guidance for Managing Emerging Risks to Enhance Resilience"
will contribute to the further development of integrated management processes that provide insight into how risk may affect the achievement of organization objectives. The development of the standard is assigned to the Work Group 8 (WG8) of the Technical Committee TC262. The work started in June 2018, taking DIN SPEC 91299 (CWA 1664), the work of the ISO TC292 (ISO 223xx standards) and the works of organizations such as OECD, SRA, WEF and EU (projectsiNTeg-Risk and SmartResilience project, ResiStand) as its main reference. The main calling is to provide universal, yet meaningful guidance on developing new competencies and business models to create relevant and realistic recommendations in an ever-changing uncertain world, to facilitate best practices, enhance resilience, promote agility, assist transformation, deliver insight, insure foresight, establish value and integrate resources. publish the standard in June 2021. SILICOFCM project officially started on June 1, 2018 and the duration of the action is 42 months. 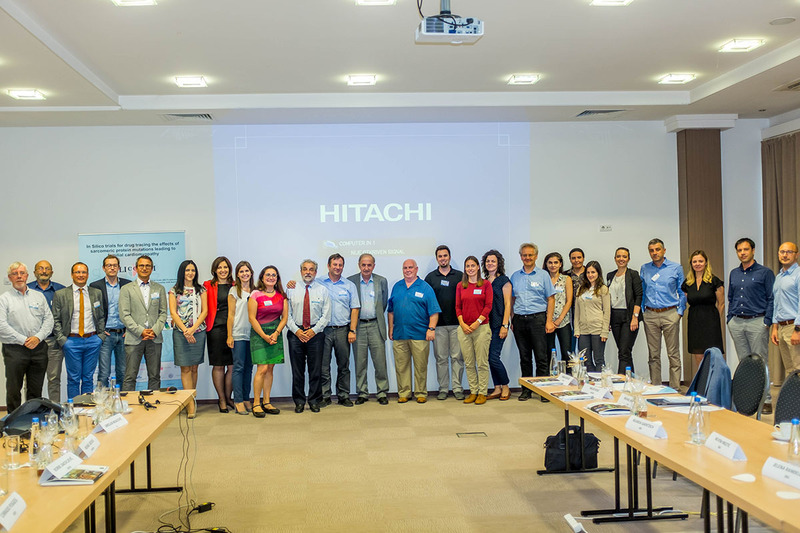 The Kick-off meeting was held in Kragujevac, Serbia on June 14-15, 2018. 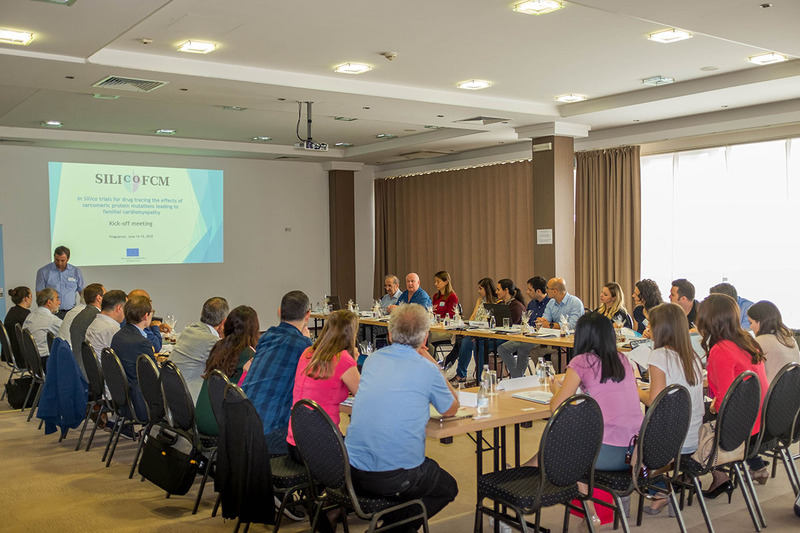 During the meeting, participating partners presented their institutions and experience relevant for the SILICOFCM project implementation. Also, the action plan for each work package for the first six months of the project was presented and discussed. According to the 2014 European Society of Cardiology Guidelines, cardiomyopathies are defined as structural and functional abnormalities of the ventricular myocardium that are unexplained by flow limiting coronary artery diseaseor abnormal loading conditions. There are four major classifications of cardiomyopathy: hypertrophic (HCM), dilated(DCM), restrictive (RCM), and arrhythmogenic right ventricular (ARVC). Familial cardiomyopathies (FCM) are most commonly diagnosed, or progress of the disease is monitored, throughin vivo imaging, with either echocardiography or, increasingly, cardiac magnetic resonance imaging (MRI). The treatment of symptoms of FCM by established therapies could only in part improve the outcome, but novel therapiesneed to bedeveloped to affect the disease process and time course morefundamentally. SILICOFCM project will develop in silico computational cloud platform which will integrate from stopped-flowmolecular kinetic assays to magnetic resonance imaging of the whole heart, bioinformatics and image processing toolswith state of the art computer models with the aim toreduce animal and clinical studies for a new drug developmentandoptimized clinical therapy of FCM. The developed system will be distributed on the cloud platforms in order to achieve efficient data storage and highperformancecomputing, that can offer end users results in reasonably short time. Academic technical partners IIT, UOI, UL and BSC will be responsible for developing and integration of in silico cloud computational platform with multi-scale cardiac muscle modelling which include experiments on protein mutation in vitro from UNIKENT, UNIFI and UW. Bioinformatics tools will be integrated by US company SBG. Clinical partners UNEW, ICVDV and UHREG will do retrospective and prospective studies. R-Tech will be incharge of regulatory issues andreports and BIOIRC will do the exploitation of the project. 2018 €100 billion for FP9 "Horizon Europe"
€100 billion for FP9 "Horizon Europe"
The EC announced the proposed budget of €100 billion and the name of the next EU Research & Innovation Framework Programme: Horizon Europe (2021-2027). 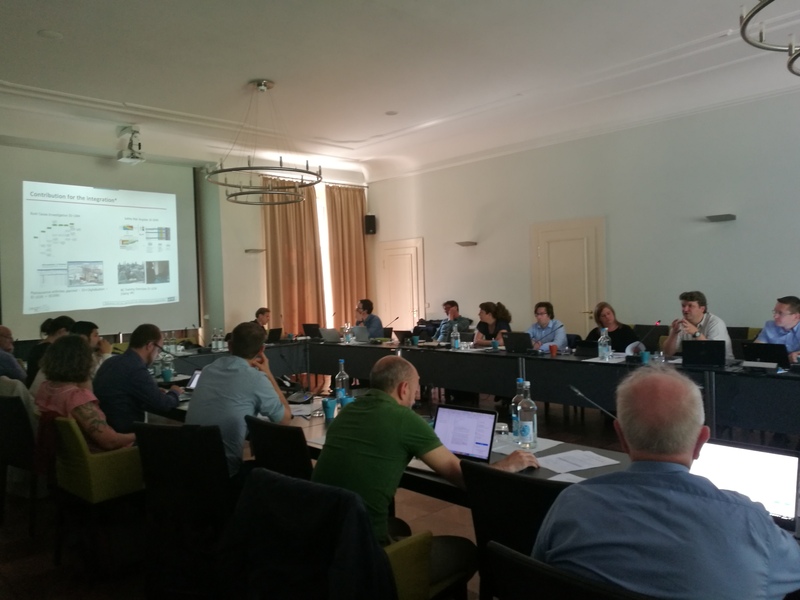 SmartResilience Project partners, members of Critical Infrastructure Resilience Advisory Board, insurance experts, and representatives of different research institutes, as well as end-users, met in Potsdam on May 29, 2018, in order to discuss the progress of the work done in the project and align the further actions needed for the remaining 11 months of the project. Around 40 participants from all over the world (China, USA, France, etc.) gathered together in the premises of Institute for Advanced Sustainability Studies in Potsdam. During the 1-day workshop, the most tangible results of the work done in the project were presented. 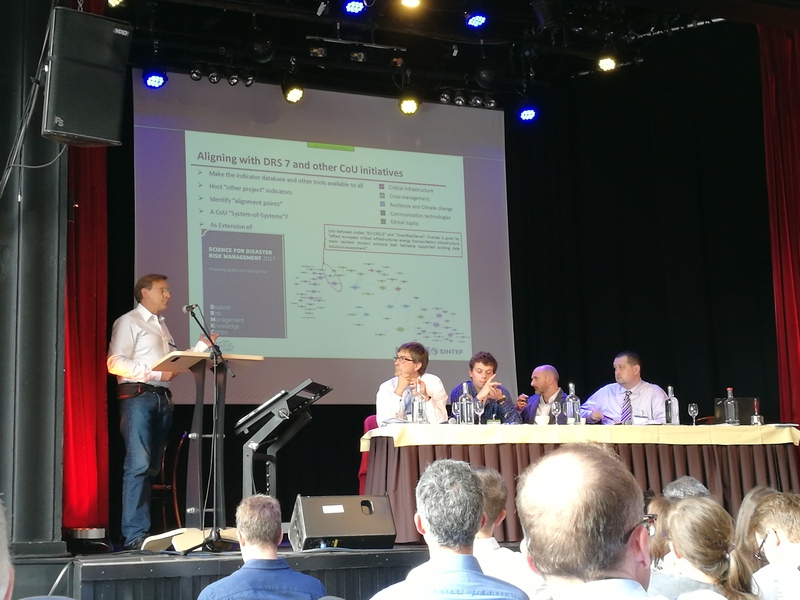 Project partners higlighted the specific issues tackled by their case studies, showing the indicators which they have selected for the assessment as well as their contribution to the integrated network/tool developed within SmartResilience. Furthermore, application of SR Tool on other EU DRS project has been presented by dr Emanuelle Bellini, coordinator of RESOLUTE. In the second part of the meeting, Frederic Petit from Argonne National Laboratory presented the need to promote a global approach to resilience. At the end, the Chair of Critical Infrastructure Resilience Advisory Board, Prof. Claudio Rolandi, and coordinator of the project, Prof. Aleksandar Jovanović led a fruitful panel discussion about the challenges related to resilience management, perspectives on enterprise resilience, and engagement of relevant politicians. The report contains the representative running projects of EU-VRi, and introduces the new model of "Membership-as-a-Service". The EU-VRi management has been reorganized, newpersons got involved. While maintaining ALL the main benefits for the current membership model starting with the project acquisition and including proposal preparation, project management, liaisoning and networking, dissemination, exploitation & implementation, standardization and education & training, the new model of “Membership-as-a-Service” has been introduced. Downdload the Annual Report at https://www.eu-vri.eu/filehandler.ashx?file=16527. 4. Sharing tools and resources developed by EU-VRi (databases, project results, reports…) free of charge. This course will be pursued also in 2018 and this opens new horizons for further scientific and business activities for EU-VRi and all its members. Help shape the NanoFASE Framework! The NanoFASE integrated environmental Exposure Assessment Framework applicable to engineered nanomaterials will enable understanding and prediction on the "exposure" side of the risk assessment equation (Risk = Exposure x Hazard). If you are attending SETAC Rome – SETAC Europe 28th Annual Meeting, come learn about concepts and approaches underpinning our "Exposure Assessment Framework" and help us tailor it to be even more suited to your specific needs in the Regulatory, Industrial or Research sector. Progress is needed in the prediction of environmental distribution, concentration and form (speciation) of nanomaterials, to allow early assessment of potential environmental and human exposure and risks, to facilitate safe product design and to include these aspects in nano regulation. Delivers the understanding at all levels to support dialogue with public and consumers. NanoFASE seeks to provide a level of engineered nanomaterial fate and exposure assessment at least comparable with that for conventional chemicals. For that, our 35 partners are developing a set of novel concepts and approaches, which underpin the Framework and accompany your assessments. 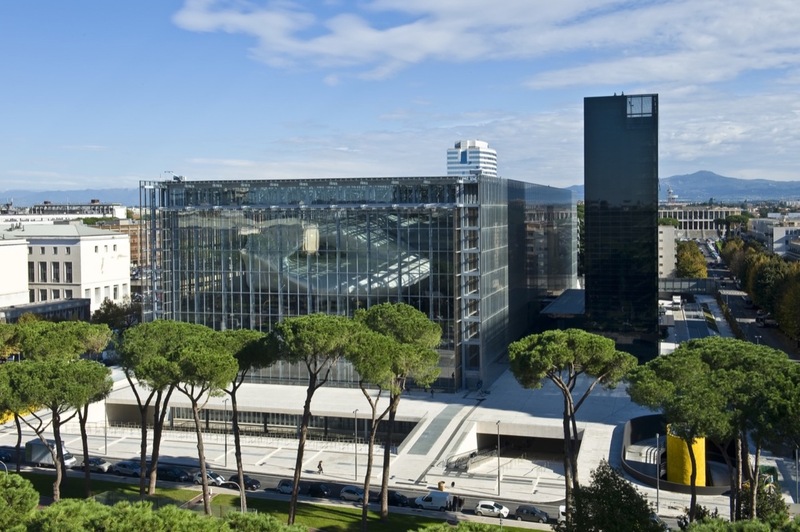 Our stakeholder consultation to bring the Framework to a new level will take place in the conference center at SETAC (Society of Environmental Toxicology and Chemistry) Rome – SETAC Europe 28th Annual Meeting. Sign on to explore the scope and practicalities of the NanoFASE Exposure Assessment Framework and influence its form and applicability. The 2-hour consultation on the afternoon of Monday, 14 May is a hands-on guided tour through the NanoFASE Clickable Exposure Assessment Framework using case study particles as exemplars. These include metal and metal oxide materials used in products such as antifouling paints, textiles, photocatalytic coatings for roads, inks, waste water treatment additives, and ground water and soil remediation products. Our approach encompasses value chain pathway analysis, transport and transformation processes throughout air, soil, freshwater, marine and biotic environmental compartments. By participating in the consultation workshop, you will learn about concepts and approaches underpinning the NanoFASE Exposure Assessment Framework, and shape the interface to make it applicable in your own stakeholder context. Selected participants only, to ensure representation of the full scope of stakeholders. Max no. of participants: 24. For stakeholders who cannot attend the event at the venue or in case of more participants than we can accommodate in Rome, a "reporting and follow up" webinar will be organized in June 2018. Please select separately for the webinar in the registration link. Regulators, industry and consultants, academics and standardization bodies. Organizers: C. Svendsen & L. Walker (NERC), C. Mays (Symlog), G. Balachandran & A. Jovanovic (EU-VRi). NOTE: As the number of participants is limited to 24, a final confirmation regarding the acceptance will be provided by April 23, 2018. The project has received funding from the European Union's H2020 research and innovation programme (call H2020-EU.2.1.2.2. - Ensuring the safe and sustainable development and application of nanotechnologies; grant n° 646002). Participation in the workshop is free of charge for SETAC attendees and also for webinar participants, but registration is mandatory! The H2020 project ResiStand (Increasing disaster Resilience by establishing a sustainable process to support Standardisation of technologies and services, www.resistand.eu) was successfully finished end of April 2018. 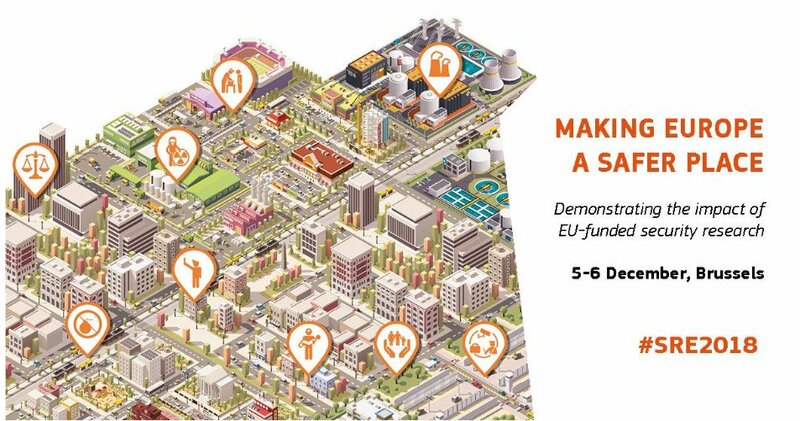 ResiStand is a two-year project (May 2016 - April 2018) that aims to identify new ways to improve the crisis management and disaster resilience capabilities of the European Union and individual Member States through standardisation. Whilst standardisation is a powerful tool with the potential to maximise technical, procedural, operational and semantic interoperability, there is a need to overcome apathy and limited participation from stakeholders. ResiStand contributed to an improved disaster resilience by identifying and analysing the drivers, constraints and expectations of three main stakeholder communities: Standardisation Organisations, End-Users, and Suppliers, consisting of researchers, industry and SMEs. ResiStand’s partners worked with these communities to identify standardisation gaps and to create a prioritised roadmap for new initiatives. The roadmap was complemented by a critical evaluation of standards as a tool to improve disaster resilience. Additionally, ResiStand implemented a pre-standardisation process that supports the development of standards. Proposing new standardisation activities that can advance and improve disaster resilience. Providing a better understanding of the potential of standardisation as a tool for improving disaster resilience. Presenting a new, sustainable process for better and faster capitalizing on the potential of standardisation. EU-VRi was co-coordinating the project and lead the development of the ResiStand Process, which aims at improving the coordination of activities at EU and international levels as well as cross-fertilization among different sectors. 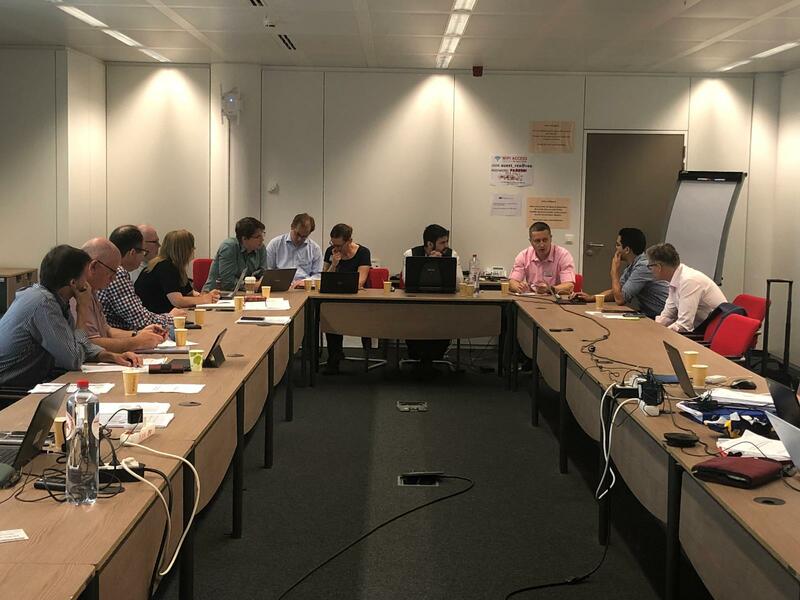 In addition, EU-VRi was leading the Workpackage that had the goal to perform of the Gap Analysis of Standardization Needs in the area of Crisis Management and Disaster Resilience. EU-VRi members DIN, Fraunhofer, Steinbeis R-Tech and D’Appolonia are part of the project consortium. 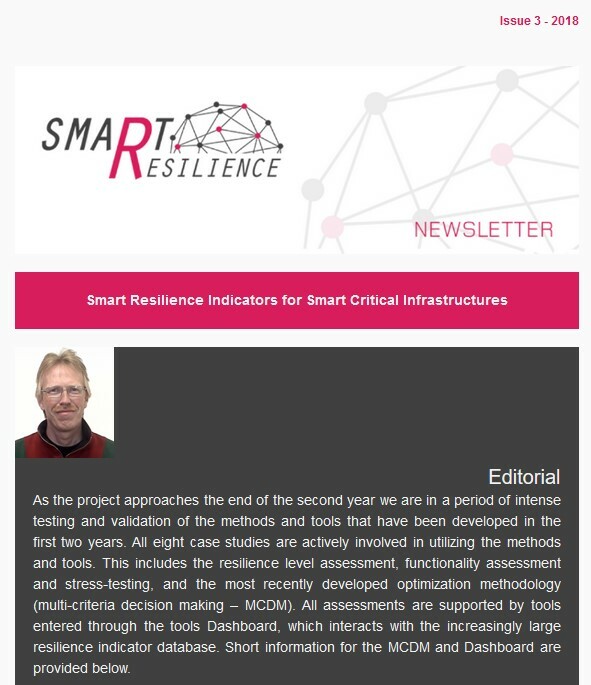 Approaching the end of its second year, SmartResilience has released its 3rd newsletter! This newsletter gives some hints about the project progress and results as well as information about the use of big data in the project, and the short information for MCDM & Dashboard. 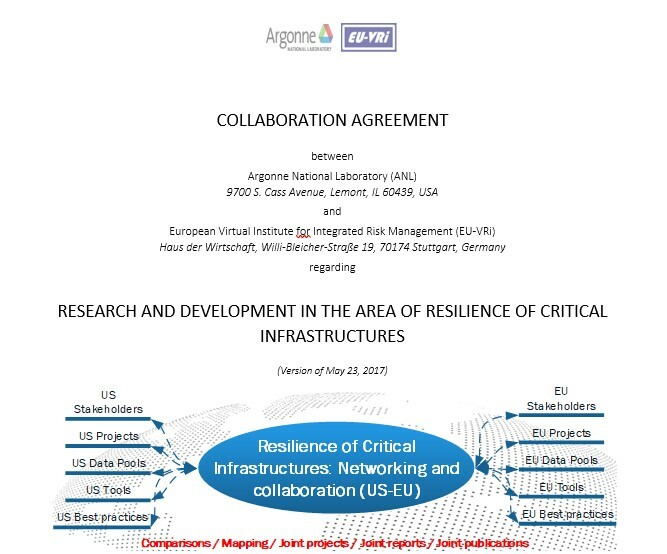 EU-VRi and Argonne National Laboratory (US) sign a MoU in the field of resilience of critical infrastructures ! Early 2018, the European Virtual Institute for Integrated Risk Management (EU-VRi) and Argonne National Laboratory (ANL) have signed a Memorandum of Understanding with the aim of strengthening their collaboration in the field of resilience of critical infrastructures. Argonne National Laboratory is a science and engineering research national laboratory operated by the University of Chicago Argonne LLC for the United States Department of Energy. This new collaboration aims to develop the mechanisms and processes to promote research, academic exchange and cooperation for the mutual goal of improving safety, security and sustainability aspects of resilience of critical infrastructures. This exchange of information will include resilience related indicators, assessment methods, tools, auditing for the improvement of protection of critical infrastructures. A questionnaire focusing on the monitoring and reporting requirements as described in the Directive has been launched. The European Commission, DG Environment, has awarded a study contract  to Amec Foster Wheeler (study lead), the Institut National de l’Environnement Industriel et des Risques (INERIS) and the European Virtual Institute for Integrated Risk Management (EU-VRi) to support the review of the current monitoring system established under Directive 2012/15/EU, the Seveso III Directive . The Seveso-III-Directive concerns the control of major industrial accidents involving dangerous substances and provides a benchmark for industrial accidents policy in the EU and beyond. The Directive applies to establishments where dangerous substances are used or stored in large quantities. The aim of the Directive is to prevent accidents and, where they do occur, to effectively minimise their consequences. The current monitoring system has now been in use for many years. While the overall current monitoring system is deemed appropriate, with the increased knowledge, experience gained and general political developments as well as more modern reporting standards it is appropriate to assess whether the monitoring system can be further improved. Considering that during 2018 and 2019 the updates of the relevant Commission Implementing Decisions are due; it is particularly important to ensure that the right data is being collected with an adequate level of administrative burden before preparing the new Decisions. Furthermore, the responses to the questionnaire will be used to identify whether an adaptation of the data collected might be necessary to allow the establishment of policy indicators to better monitor and communicate on the achievements of the Directive. Overall, the aim of this questionnaire is to gather feedback and insights from a range of stakeholders on the usefulness of the current monitoring system and, if appropriate, possible ways to improve it. The questionnaire focuses on the monitoring and reporting requirements as described in the Directive. Prevention and control of accidents is achieved through specific requirements placed upon operators storing or handling certain dangerous substances above a threshold quantity. There are requirements for both operators and Member State competent authorities. Please complete all of the sections / questions that you are able to. Where you are not able to answer any of the questions – either through lack of data or because it is not relevant to you/ your organisation – there is no need to provide a response. If you would prefer to discuss the questionnaire over the phone rather than draft a written response do not hesitate to contact the contractors. We would also welcome any additional supporting documentation you are able to provide. Please fill in this survey by March 28, 2018. It takes approximately 30 minutes to complete. 2017 Fourth SAF€RA joint call on the themes "New technologies and the effects of major changes in industry" and "Measuring and monitoring safety performance"
SAF€RA has launched its fourth joint call for transnational, collaborative research projects. The call aims to foster collaboration between researchers from different countries in Europe and from different scientific disciplines, in order to improve safety and the management of technological risks. person-months for personnel from certain participating institutes and research organizations. Most projects funded within this call will include 2 to 4 partners, for a duration between 12 and 36 months and funding between 20 and 150 k€ per project partner. The call aims to fund mainly applied research carried out in universities or research institutes, though contributions from industry are also eligible. Interdisciplinary research is encouraged. Cooperation and joint activities between different consortia funded within the call will be encouraged. The 2018 joint call will use a two-stage application process with a pre-proposal mechanisms for the first stage. The calendar of the various stages is shown below. The Guidelines for proposers contains a description of the topics covered by the 2018 joint call, information on the participating funding organizations and the budgets available, and other important information for researchers wishing to submit a proposal. The Guidelines for evaluators are written for the experts who will evaluate the projects, but will be useful to researchers who wish to understand the evaluation criteria. The pre-proposal form is available in Microsoft Word (.doc) or OpenOffice/LibreOffice (.odt) formats. A web-based matchmaking facility is available to help researchers wishing to submit projects as a consortium to find partners. For general queries concerning the 2018 joint call, please email the call secretariat at call-secretariat@safera.eu. Make sure you read the call documents above and check the list of frequently asked questions first. If you have questions concerning the eligibility criteria of specific funding organizations, please check the contact information provided in the Guidelines for proposers document, which can be downloaded above. For more information, please visit the call website at www.call.safera.eu. 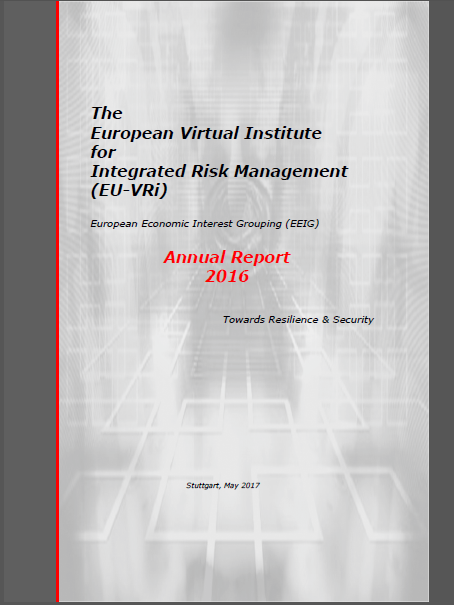 The EU-VRi Annual Report 2016 is now available. For download please click here. After the challenging year 2015 and a lot of effort invested into new topics (security & resilience) and collaboration with industry, the year 2016 was marked by the actual start of the corresponding projects. The new wave of projects resulted in the consolidation of the overall situation and has allowed to more than compensate the losses of 2015. 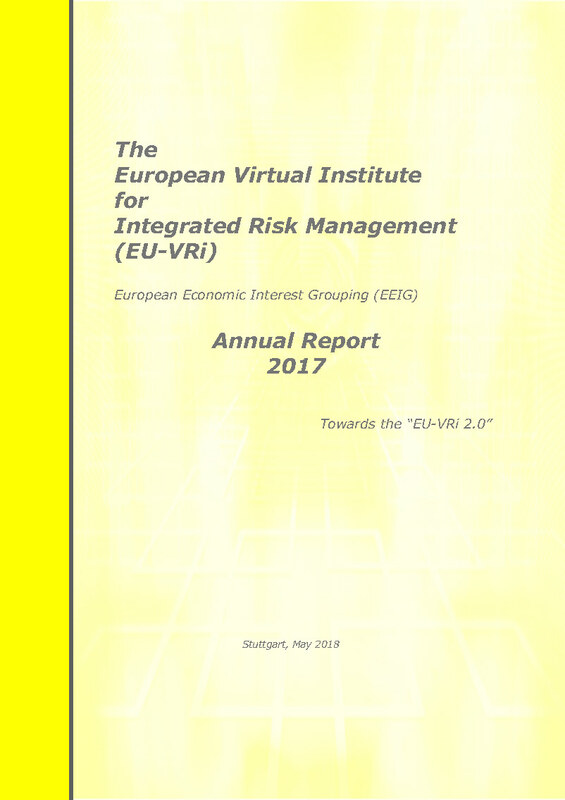 In addition, the consolidation helped to strengthen the leading role of EU-VRi in the European and internationals risk-related activities, initiatives and projects. Keynotes, contributions, papers and presentations at meetings and conferences have clearly confirmed this. 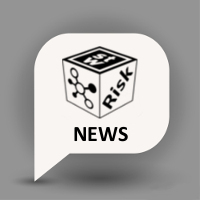 As “broker and coordinator” EU-VRi has continued its activity as Operating Agent of the European Technology Platform Industrial Safety (ETPIS), Operating Agent of the SRA-Europe (Society for Risk Analysis Europe) and the Operating Agent of the European Safety and Reliability Association. 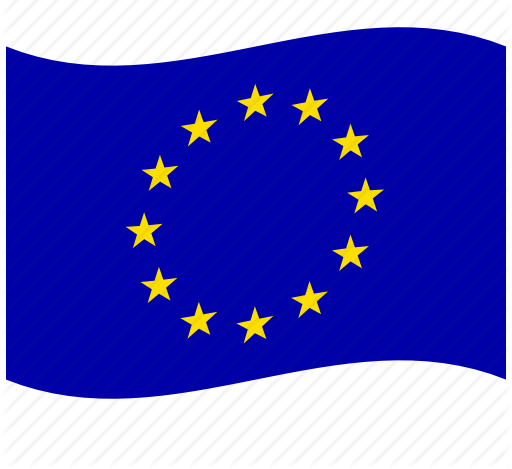 As the “project leader and coordinator”, EU-VRi has contributed to safety-security EU integration through the EU projects like SmartResilience (“Smart Resilience Indicators for Smart Critical Infrastructures”) and ResiStand (“Increasing disaster Resilience by establishing a sustainable process to support Standardisation of technologies and services”), as well as through the industrial projects like PSMS (“Implementation of the Process Safety Management System into NIS j.s.c. Novi Sad”). · Over 4.5 Mio € in EU-VRi turnover. Finally, in 2016, the construction of the “bridge” between safety and security, announced already in 2014 has been successfully realized in large European projects. This will be pursued also in 2017 and this certainly opens of new horizons for further scientific and business activities for EU-VRi and all its members. Workshop entitled: ''Aligning the resilience-related research efforts in the EU DRS Projects'' took place in BAO Centre in Brussels on September 13-14. Session 1: Towards the aligned European Resilience Management Guidelines: How to achieve alignment and interoperability? Session 2: Resilience assessment method and indicators: How to define them? How to monitor them? How to implement them? Session 4: Application cases – are the newly developed methods, guidelines & tools implemented/analyzed? Session 5: Importance of international/global cooperation in the area of resilience – How to enhance it in the future? Furthermore, in the Interactive Space audience had an opportunity to become familiar with projects' outcomes and dissemination materials. 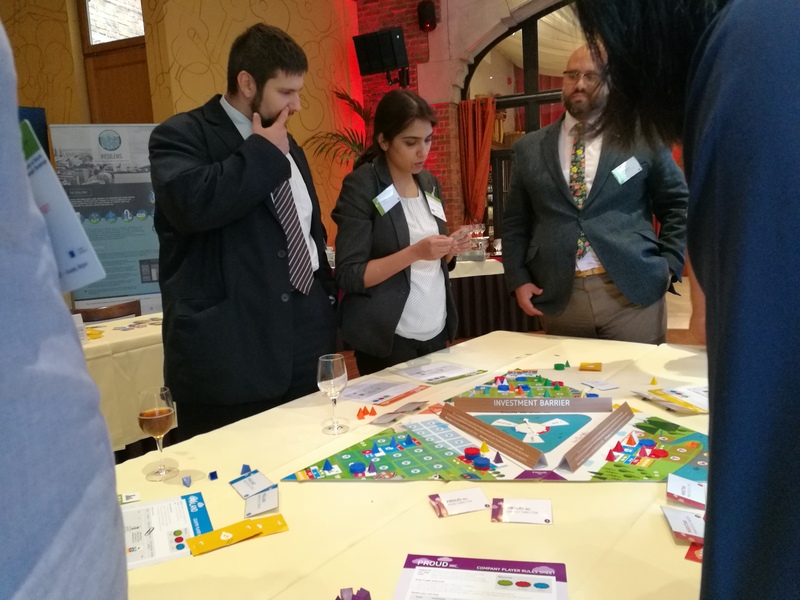 Also, thanks to presence of Nexus Perspectivity Challenge Game, experts had a chance to be put in the shoes of key decision makers. The most important findings of the workshop agreed among projects coordinators have been summarized and can be found here. In order to download the book of abstracts please click on the picture below. Below are uploaded presentation slides as .pdf files for sessions held during the Resilience Workshop. The content, style or layout of the slides should not be changed without the permission of the authors. Resilience Workshop will take place in Brussels on September 13-14, 2017. Following the initiatives coming from several DRS-projects and support expressed by the European Commission, this joint workshop is organized with the goal to ensure collaboration and alignment among the projects, especially in the areas related to methods, guidelines and tools developed in the projects. The challenges related to aligning experience, findings and lead to research in single project towards a ''common approach'' will be tackled during this workshop and the possibilities for joint practical actions examined. Session 2: Resilience assessment and indicators: How to define them? How to monitor them? How to implement them? Session 4: Application cases: Where the newly developed methods, guidelines & tools have been implemented / analyzed? all other interested Community of Users (CoU) members and external parties are cordially invited. Please, register online (room limitations: 120 participants). Participation in the workshop and the course is free of charge, but registration is mandatory! The 5th SAF€RA Symposium in Bilbao, on May 18-19, 2017. The 5th SAF€RA Symposium will take place in Bilbao, Spain, on May 18-19, 2017. It is to present and discuss results from the first two SAF€RA joint calls, give an insight to research needs in industrial safety, and provide details of the 3rd SAF€RA joint call. The registration is free of charge. Only the dinner on May 18 and the lunch on May 19 will be at your own cost. Presentations dedicated to scientific topics and with wish to open new collaborations are encouraged. Deadline to submit an abstract: April 7, 2017. SAF€RA originated as an ERA-NET project entitled 'Coordination of European Research on Industrial Safety towards Smart and Sustainable Growth' that was funded for three years by the European Commission in the 7th Framework Programme (Grant agreement no: 291812). Under the ERA-NET scheme it identified areas of joint interest and expected synergies of collaborative research, and stimulated transnational research on industrial safety. SAF€RA brings dynamism into European research on industrial safety where it cannot be tackled at the national level. SAF€RA will continue in context of the European Technology Platform on Industrial Safety, ETPIS, which initiated the original SAF€RA project. Jointly organized by five major FP7 projects NANOSOLUTIONS, GUIDEnano, SUN, NanoMILE and eNanoMapper, the NMSA conference will take place in Malaga on February 7-9, 2017. Jointly organized by five major FP7 projects NANOSOLUTIONS, GUIDEnano, SUN, NanoMILE and eNanoMapper, the NMSA conference will take place in Malaga on February 7-9, 2017. The conference aims at presenting the main results achieved in the course of the projects fostering a discussion about their impact in the nanosafety field and possibilities for future research programmes. The conference welcomes consortium partners from the organizing projects, as well as representatives from other EU projects, industry and government, civil society and media. The conference will be wrapped up with a stakeholder workshop which will provide a platform for an open discussion with interested stakeholders that could ultimately guide the research needs that should be addressed in future projects. The Call for Abstract is open until the September 30, 2016. Submissions of full papers are due via Safety Science’s submission portal on February 1, 2017. Societal safety refers to the consolidation of society’s robust “normal” functioning and includes the prevention and absence of major disruptions within and across key sectors. When failures occur, societal safety incorporates the ability to respond to and cope with external or internal stresses, such as natural hazards, terrorism and major industrial accidents. Critical infrastructures are the lifelines of modern societies and their reliability is essential for societal safety. Sectors, organizations and populations are organized around the expectation that infrastructures function, typically with near 100 per cent reliability. Their success—their usefulness and high reliability —produces societal vulnerability and challenges in terms of governance, as dependence on them is engrained in the fabric of society. Joint and coordinated efforts from different disciplines are required to maintain societal safety in general and critical infrastructure reliability in particular as both the vulnerabilities and the resources for resilience straddle organizational, sectoral, jurisdictional and national boundaries. 1) Neoliberal forms of governance have led to more fragmented organizations while sectors of society have become more tightly coupled. 2) Digitalization has introduced new, often intractable, interdependencies and couplings, increasing complexity and the potential for domino- or cascade effects. It opens up new vulnerabilities related to intentional and accidental events but also new means for risk monitoring and coordination in emergencies. 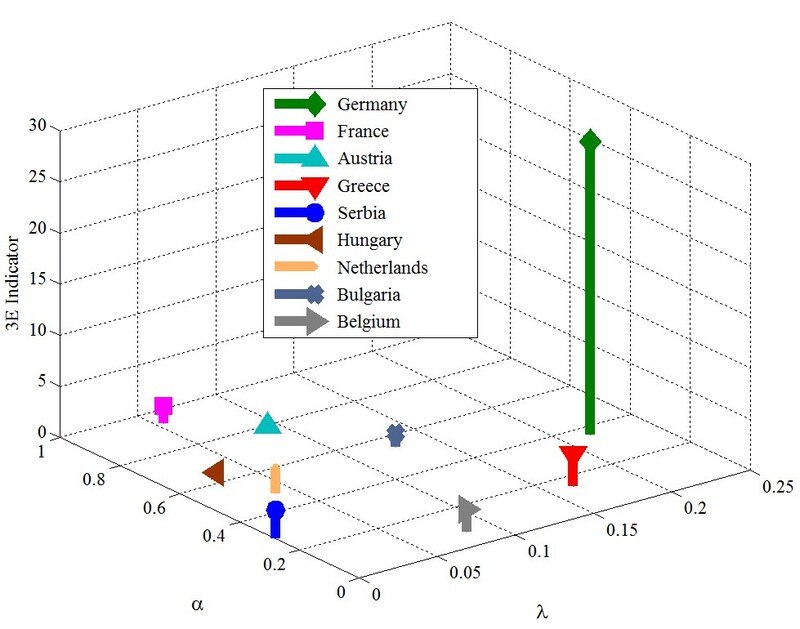 While the dependency on highly reliable critical infrastructures and digital technologies may invite models of societal safety based on strict rules and regulation, the last decades of safety and reliability theory has increasingly been concerned with how system variability is handled in dynamic ways and how situational adaptations and adjustments can be resources for resilience. Our Special Issue specifically encourages reflection on the boundaries of this adaptability, the managing of adaptability, and its regulation. The special issue invites papers discussing societal safety as operational and societal issues. We are particularly, but not exclusively, interested in papers discussing the inter-organizational/inter-sectoral management of societal safety, case studies of critical infrastructures and organizations/agencies responsible for societal safety, resilience based perspectives on societal safety, perspectives on the management on the societal interconnectedness of risk and on the relationship between safety and security. We are also interested in theoretical and empirical contributions addressing the implications of digitalization and neoliberal governance (New Public Management, managerialism, public-private partnerships etc) for these topics. The length of submitted papers will be between 7,000 and 10,000 words. Submitted papers must be unpublished and not currently under review by other journals. Papers using previously published conference papers should not exceed 20% similarity. Submissions of full papers are due via Safety Science’s submission portal on February 1, 2017. Papers must be in accordance with the ordinary format requirements of Safety Science. We also invite interested authors to submit abstracts or extended abstracts (by email, max 1000 words) to the editors by October 15, 2016. This is not mandatory for full paper submission. The European Project EDEN has recently published a press release "When numbers count". Fifteen demonstrations, 109 tools evaluated, more than 200 End-Users involved and 90 gaps addressed: these are the headline numbers presented by the Coordinator of the European Project EDEN, Clive Goodchild (BAE Systems), during the final conference held in Brussels on 11 and 12 October 2016. These figures represent extensive work by 36 partners from 15 European countries who for more than three years developed innovative tools and procedures for preventing and responding to CBRNE (Chemical, Biological, Radiological, Nuclear and Explosive) threats and incidents with a focus on integration of capabilities, technologies and systems. As part of the consortium development activities over 50 existing tools were developed and matured, including new methods for determining system resilience, hazard and population response modelling, remote sampling and detection, multi-level situational awareness systems and a European first (Nuclear Reactor core integrity sensing) and 10 new innovations were invented and developed during the Project, with 2 of them being taken to full commercial availability. A new concept for allowing existing systems to be integrated with new innovations was demonstrated and implemented in all demonstrations. The fifteen demonstrations were grouped into three scenario themes: firstly, emergencies arising from biological and chemical contamination in the food supply chain, secondly responses to chemical attacks and thirdly radiological and nuclear security. The demonstrations ranged from Large Scale Actions, with the active involvement in the field of hundreds of First Responders to Table Top Exercises carried out in simulated environments. The added value of the EDEN project was the deployment during the demonstrations of 109 tools and their evaluation by End-Users who assessed whether the tools were effective in addressing the gaps identified at the beginning of the project during a series of workshops and provided feedback on improvements that could be made to meet there operational needs. Great importance was set upon the constructive involvement of SMEs during the demonstrations who nowadays play an energetic and constructive role in R&D for the security sector and whose contribution to EDEN was coordinated by the SME Platform working closely with the Supplier Platform. Two key elements of the EDEN Final Conference was the presentation of the final version of the EDEN STORE and the CBRNE FAIR 2016 held simultaneously with the Conference. EDEN STORE is web accessible application providing stakeholders in the CBRNE sector a set of functions which include a catalogue of more than 270 tools with different capabilities and functionalities, a simulation and real time crisis management environment, a secure forum to allow practitioners to share information and expertise and a central repository to share training kits/modules and operating procedures. This achievement puts Europe ahead in the field of research and development in the CBRNE sectors of prevention and response. It is accessible through the link https://eden.astrium-eu-projects.eu after authentication. 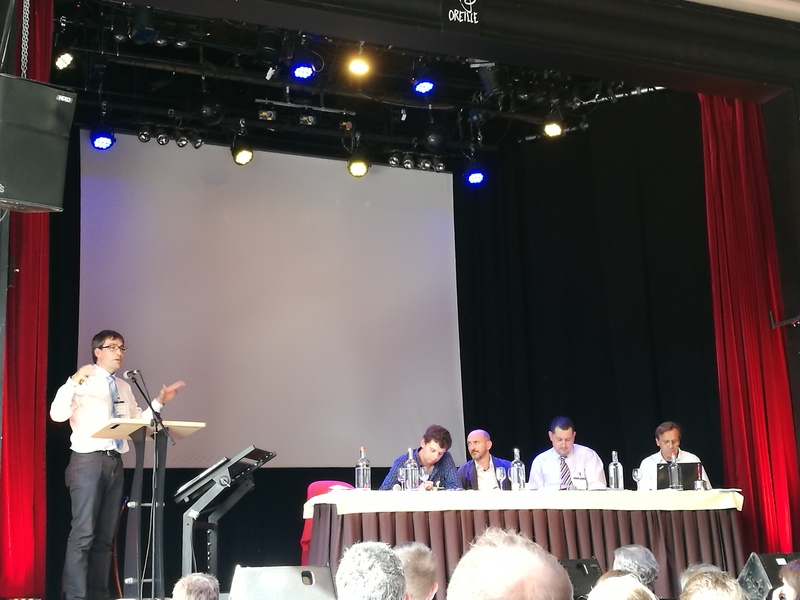 The CBRNE FAIR 2016 was a two day exhibition held in Brussels where the Project EDEN partners and members of the SME and Supplier Platforms exhibited solutions developed during the project. Stakeholders and End Users had the opportunity to learn about the project and its results. The Fair was an important opportunity for the cross-fertilisation of research ideas including product development and an opportunity to boost collaboration between organisations thereby enhancing European liaison to tackle the CBRNE threats. The legacy of Project EDEN is conspicuous and valuable providing a tangible impact for improving the security of European citizens and infrastructure. Updates and reports on the EDEN project are available at the web address https://eden-security-fp7.eu/. 2016 European SME week “Helping Europe’s entrepreneurs reach new heights” - How do SMEs benefit from standards? 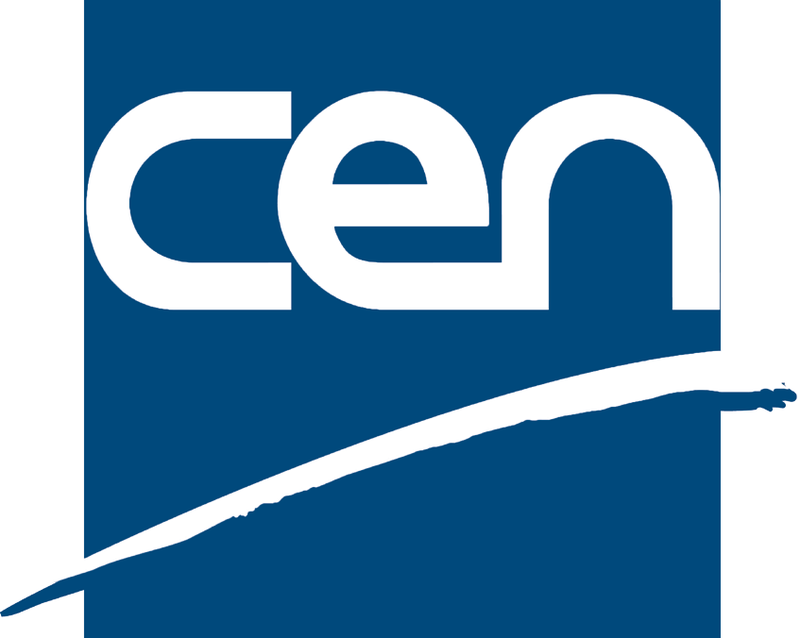 CEN and CENELEC together with SBS (Small Business Standards) would like to showcase how standards can help SMEs to reach new heights. How do SMEs benefit from standards? Within a fortnight we will be celebrating the European SME week! A great opportunity to promote how standards help SMEs to do better business. This year’s theme is “Helping Europe’s entrepreneurs reach new heights”. CEN and CENELEC together with SBS (Small Business Standards) would like to showcase how standards can help SMEs to reach new heights. Are you an SME, take this opportunity to promote your business! Send a quote (max. 100 words) and share why you use standards and/or why you are involved in standardization. Maybe you contributed to the development of a particular standard? Tell all about it! Your activities will be promoted through social media and on website to kick-start the SME week on 21 November. 1: There are many benefits that SMEs can gain from using standards. Knowing which standards to use, and how to apply them in the correct way, is vital for the success of your business. Which standards are relevant to your company? 2: It is also important to understand how standards are made, and how SMEs can contribute to the standardization process. 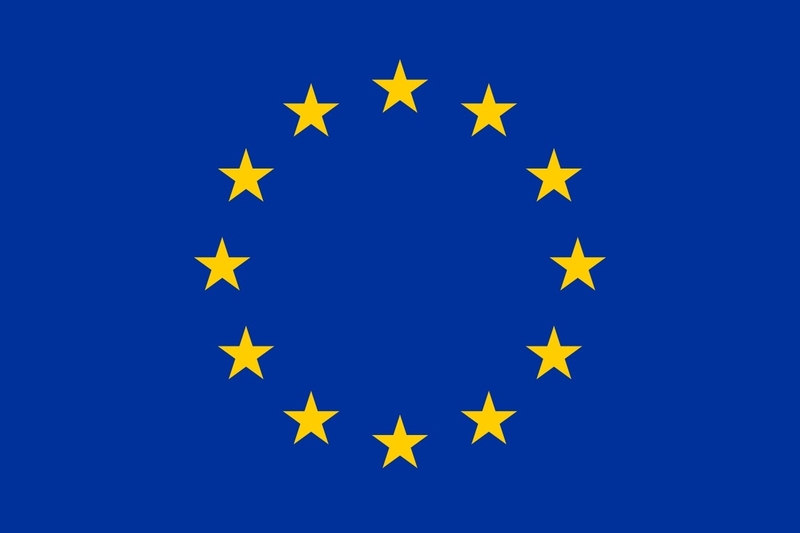 Why did you get involved in European standardization? What challenges if any did you meet? How do you think the standards organizations (or anyone else) can help? CEN, CENELEC and SBS are looking forward to receiving your quotes by November 16 at SME-NEWS@LISTSERV.CENCENELEC.EU. Unless explicitly mentioned, CEN/CENELEC and SBS understand that they have agreement to publish and share the quotes/pictures received. The CBRNE INNOVATION FAIR 2016 and the EDEN final conference will take place 11-12 October 2016 in Brussels. The CBRNE INNOVATION FAIR 2016 will take place 11-12 October 2016 in Brussels and will bring together decision-makers, from government, operational units, industry, science and research in CBRNE and crisis management. The industry’s top performing companies and organisations will present their products and innovations. Among the products presented a special focus will be on EDEN Store, tools developed by the EDEN project and constructive dialogue and collaboration on topics relevant to disaster risk management and crisis management. The EDEN Consortium invites decision makers, operators and donors of CBRNE technologies to join its Final Conference on 11 October 2016 organised jointly with the CBRNE INNOVATION FAIR 2016 in Brussels. During the event, EDEN partners will present their results and achievements obtained in the last years of work in terms of technology, procedures and methods for the management of CBRN accidents. The EDEN Store will be presented and the movies from the validation exercises displayed. Attendance is free of charge, but registration is required (number of visitors is limited). The conference Resilience and Technological Risk: comparative experiences 40 years after the disaster in Seveso will take place June 29th, 2016 at Committee of the Regions in Bruxelles. In the occasion of the "40 years anniversary of the disaster of Seveso*", The European Commission would like to invite you to the conference Resilience and Technological Risk: comparative experiences after the 40 years of disaster of Seveso to analyse in-depth the effectiveness of the adoption of the European Directives and by local governments and debate how “resilience actions” have been lasting uninterrupted for forty years. Experts of the European Commission and EU regional authorities will discuss how risk management and prevention have been improved thanks to the synergy between Institutional and socio-economics regional and local structures as well as the new perspectives: ranging from environmental restoration, scientific research and safety regulations. Confirmation to the participation is required by June 20th, 2016 to silvia.dognini@flanet.org (specifing surname, first name, date of birth, type and number of document, organization). *The accident of Seveso (July 1976) marked the start of a series of “resilience actions” which has been lasting uninterrupted for forty years thanks to an active participation of the civil society. CEN (European Committee for Standardization) is currently looking for experts to carry out the work under the Specific Grant Agreement SA/CEN/GROW/EFTA/000/2015-09 "Guidance for the security of CBRNE substances for healthcare facilities along their lifecycle". Further details are available at CEN website and UNMZ website. Interested experts are kindly requested to send the completed form in Annex 2 (Application Form) by 18th of March 2016 12:00 CET, to Mr. Stefan Krebs (krebs@unmz.cz ) by e-mail. Please duly fill in the Application Form when applying for one of the eligible positions. Applications received after the deadline will not be taken into consideration. The selected experts are expected to start work late April and work together with the CEN/TC 391’Societal and Citizen Security’ to prepare a technical specification under the guidance of the CEN/TC 391 convenor. 2015 R-Tech to help mapping and calibrating nanorisks in the EU! In the new Horizon 2000 project caLIBRATe of Steinbeis R-Tech will play a key role in the development of the next generation EU tools for risk governance of nanomaterials. The main objective of caLIBRAte is to funnel the state-of-the-art in Nano safety research and merge it with state-of-the-art risk governance and communication. It will provide versatile risk governance tools and the framework for assessment and management of human and environmental risks of micronano and micronano-enabled products. R-Tech is going to take a leading role in the project by developing the Nano-Risk for the identification and monitoring of nanotechnology emerging risks. In addition, R-Tech will consolidate the caLIBRAte Nano-Risk Governance framework by developing the System of Systems (SoS) platforms. The framework models will be linked to the 10 steps of the ERMF framework developed within the iNTeg-Risk project and support the Cooper-style stage gate innovation model as a special interface for different stakeholders.